Finally! The much anticipated sequel to one of adventure gaming’s classic games is here. Sam & Max Episode 1: Culture Shock delivers a seamless blend of humor and mayhem. The happy result -- excellent entertainment! While it doesn’t contain the deepest story, nor does it provide groundbreaking graphics, it delivers a lot of fun stuffed into one small package. In case you don’t know, Sam and Max burst on the scene in 1987 in their premier comic book, Monkey Violating the Heavenly Temple. This ludicrous title provided a foreshadowing of the madcap adventures to follow. 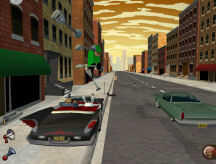 In 1993, Lucas Arts produced the hugely popular adventure game, Sam and Max Hit the Road. In 1997, the demented duo starred in a Saturday morning cartoon. A second video game was planned but never produced, leaving many disappointed fans waiting and hoping for more. Telltale Games has ended that wait with Culture Shock, the first release in a series of six planned episodes. Each episode is a complete mystery, but all will combine to form a larger story. So, what’s it about? It seems that Straight Street has been invaded by those most dreaded of evil beings, the Soda Poppers. These former child stars, long past their prime, are dedicated to converting the world to Eye-Bo, “the world’s foremost ocular fitness program.” It’s up to the Freelance Police to save us all. Sam and Max set out to do just that in their own “shoot first and ask questions later” style. Culture Shock provides a generous amount of character interaction. Our stars, Sam (a six-foot-tall dog) and Max (a three-foot-tall maniacal rabbit) are surrounded by players as outlandish and idiosyncratic as themselves. In typical comic book style, many have exaggerated proportions, such as Sybil’s oversized glasses or the Soda Poppers’ extra-large heads. Lip synching is normally well done, but I noted a time or two when it was just a bit off. Expressions change a bit, but not a great deal. In this instance, the theory “less is more” works well. Dialogue is front and center in this game. It’s witty, funny, sarcastic, over-the-top and almost always tongue-in-cheek. Sam and Max banter between themselves as well as with the game’s NPCs. Along the way they take long-winded verbal pot shots at nearly everything. There’s scads of dialogue in Culture Shock. Most of it is humorous, with clues tucked tantalizingly among the irrelevant jests. Occasionally you can answer as either Sam or Max. Sam’s lines are often facetious, while Max’s are outlandishly waggish. Dialogue displays in a standard dialogue tree. Right clicking skips responses. However, I listened to and enjoyed it all. 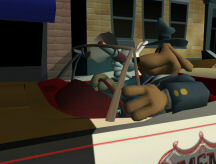 Cartoon graphics in full 3D provide a surreal setting suitable to Sam and Max’s outré behavior. Culture Shock juxtaposes the known and real with the freakish and unreal, while successfully blending comic brightness with street weary grunge. The four locations you’ll visit brim with sight gags. 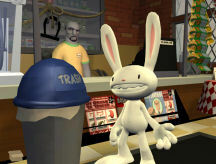 Sam and Max’s office is on a litter-lined downtown street complete with a bent parking meter and a convenience, or should I say, Inconvenience Store. Their seedy office suggests an old fashioned, down at the heels detective. But a closer look reveals bullet holes in the walls, a goldfish inside the water cooler, Jesse James’ mounted hand (with signature), and a rat hole equipped with a mailbox. The player controls Sam, who saunters along in a fluid motion as Max wanders nearby. They patrol the streets (if patrolling it can be called) in a classic Desoto. Oh, and did you notice? The sky is yellow! Most objects appear smooth. For example, Jimmy Two Teeth’s fur is gray, but slick. Brick walls are texture free. Professional voicing contributes much to the game’s success. These are not the original voice actors from the first Sam and Max game, but each voice suits the character well. Brady’s voice reminded me of Shaggy from the Scooby Doo cartoon series. The occasional whiny Soda Popper annoyed me, but that was the voice actor’s intent. Ambient sounds play a supporting role. I noticed Sam’s footsteps, occasional doors opening and closing, traffic noises, and the whoosh of a passing train. While adequate for their assigned role of filling out the game, they are not immersive. The background music is jazzy and upbeat. It succeeds wonderfully in setting and sustaining a carefree mood. Every now and then, it seemed to pay tribute to the music typical of detective shows of days past. Puzzle difficulty is well matched to the tone of the game -- light-hearted and fun. None are tricky, but the answer is not always obvious. Though I was stuck a time or two, it was never because the clue was obscure or illogical -- at least not given the context of this game. I was very pleased to find no sound, timed, or slider puzzles. I also did not find any mazes, puzzles requiring color discrimination, mini-games, mechanical puzzles, or any requiring quick reflexes. 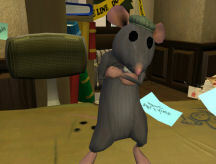 Culture Shock is a mouse-controlled, third person game. While linear, it allows the player great latitude of action. Certain puzzles must be completed to trigger key elements. However, sometimes you can complete a section of a puzzle, then work on another puzzle, or enjoy some quality time in the Desoto. Practice sidewalk driving or 360 degree aerial flips. Then, return to puzzle solving. Though advertised as two to three hours in length, I played considerably longer than that the first time through. Culture Shock downloaded via GameTap on my DSL line in about twenty minutes. It was completely stable during play. The well designed interface is intuitive and easy to use. My favorite option allows you to control the volume of each sound component individually. Other options include graphics quality, subtitles, pop-up text, and warp drive. Warp drive affects the speed of the Desoto. While too fast for my taste, it is perfect for those of the video generation. There are twenty-four save slots which is a gracious plenty, and you can save at any time. You cannot name your saves. Instead, saves are identified by a largish screen capture, date, and time. Additionally, the game auto saves with each location change. Your sparse inventory is held in an amusingly appropriate cardboard box. A click spills the contents to allow their use, and another click picks them up. The camera follows Sam’s movements. The gamer cannot control it. Occasionally, Max wanders off screen, but eventually reappears at Sam’s side. Though obviously well designed and well implemented, I have a few small complaints. I was surprised to find slower than expected transition times between scenes. Sadly, the game is not Alt+Tab friendly. And lastly, my computer “hung” for approximately a minute each time I exited the game. Since I played Culture Shock via GameTap, any or all of these problems may be related to that. But, then again, maybe not. Currently, Culture Shock is available only by download, either from Telltale Games (starting November 1, 2006) or via GameTap. Each episode releases on GameTap about 15 days before it becomes available at the Telltale site. Episodes may be purchased individually from Telltale ($8.95). Those purchasing the entire season in advance receive a discounted price and a CD containing all six parts. Obviously, this CD is not available until Episode Six is released. For GameTap users, Culture Shock is available at no extra charge. Just can’t get enough of this vagarious dog and his aberrant side-kick? Check out the extras. New animated shorts are available weekly on both the Telltale site and GameTap. In addition, GameTap is rerunning the TV series from 1997. Also, Telltale has many activities available on their site for Sam and Max addicts, and you can even get the t-shirt. I love games which make me laugh, and this one does that in spades. Humor abounds both in the settings and in the dialogue. The absurdity of the characters and the story line invoked many chuckles. Sometimes, I laughed out loud. The puzzles are diverting; some are novel. The interface is simple. Voices and ambient sounds are pleasant and appropriate. Background music reflects and enhances the flavor of the game. The graphics deliver plenty of unusual and farcical details. Because I am a member of GameTap, I don’t mind the short playing time. While this game will not suit everyone, it fits my gaming tastes like a glove. I enjoyed almost every aspect of this game, and eagerly await the rest of the series.